Schock Power Corporation spezialises in high quality power conversion products for special applications. Our latest products feature small, low profile designs. They are very robust and are built for operation and survival in rough environments. The compact packaging is ideal for good cooling and leaves many options for the application. We are used to deal with wide operational temperature ranges, humid, spray-water, ice, wide input voltage ranges, electric transients, noise, overloads, short circuits, wrong connection by the user, mobile applications, etc. Schock's proprietary technology is the base for very high efficient circuitry and designs. It is Schock Power Corporation's ambition to waste as little energy as possible and to polute the electrical and magnetical environment as little as possible and all this in very small packages. 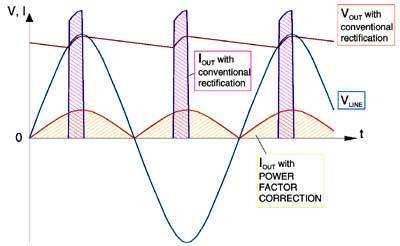 Therefore we are also big fans of Power Factor Correction on AC/DC converters. means, that the unit draws a sinusoidal current from line. It results in much lower harmonics and distortion back into the line. More Power can be drawn out of a regular line plug, since the load is distributed over the whole line period and not applied in big pulses, as in conventional power supplies. This is a new agency requirement, especially for the European Market. All of Schock Power Corporation's AC/DC products above 100W are provided with power factor correction. Click here for more information about PFC. Schock has designed and produced various converters in Eurocard design - so called, Plug-In Type Power Supplies, according to European Standards in Eurocard designs. This compact packaging is very advantageous to OEM (Original Equipment Manufacturer), since the units can be easily and quickly mounted and connected to either the backpanel, the equipment or a connector, which is wired to the equipment. Eurocard design can be realized with an RF-tight metal housing or as open pc-board.